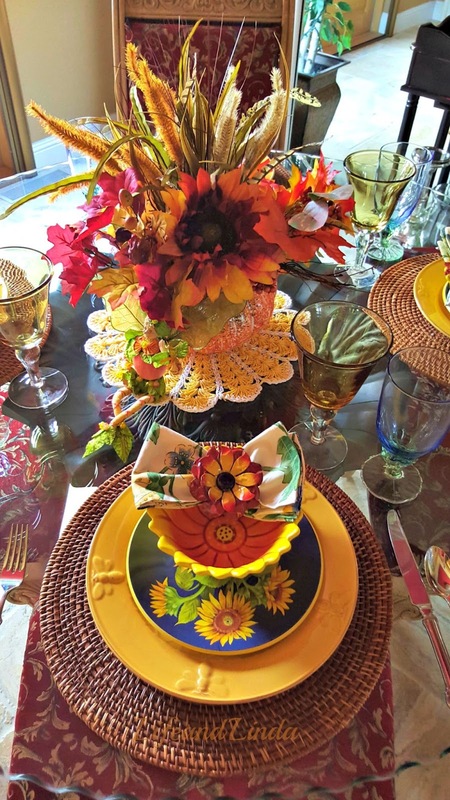 We are back to some hot temps here, but it is not stopping me from sharing a tablescape with sunflowers and pumpkins. This Breakfast room is fun to set up and share. Our larger dinner parties are in the dining room. No pillow cases this time...ha ha. Rattan chargers with Bee plates from Horchow. I am also using the Napoleon Bee flatware. 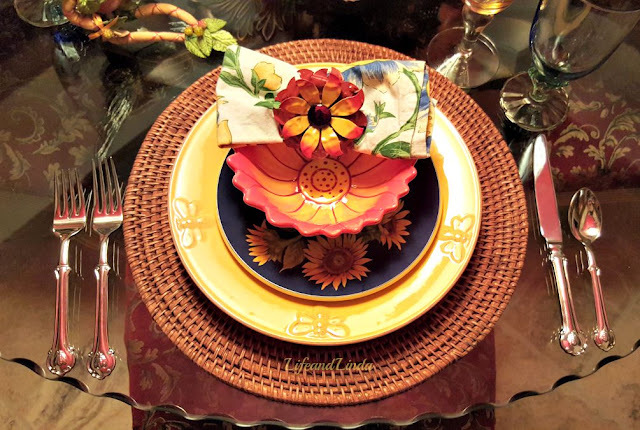 Blue salad plates with sunflowers and topped off with sunflower bowls. Floral napkin rings are holding the April Cornell napkins. 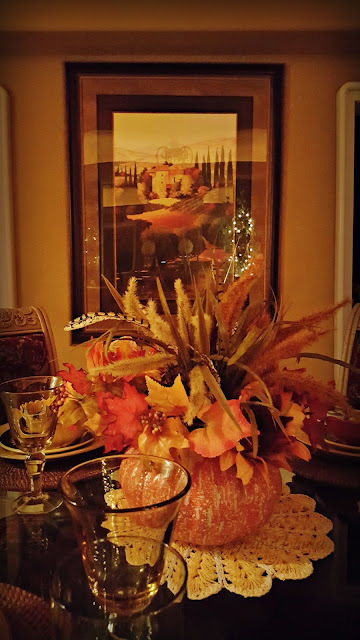 This pumpkin arrangement I created. Some large sunflowers, leaves and wheat. I added golden goblets with my Bahia blue glasses. Love our french doors with with sconces on each side. I always have string white lights on the ficus trees in here. My hubby has added most of these lights on a remote. I love the lighting effect. You can see the mirror with the reflection of the doors. A dessert cart sits in this room. I also use it for the dining room when I am having a large dinner party. Here's a different view. The chandelier is reflecting onto the painting. I started a Country and Western dance class with some Irish dancing. I must say it is fun. I love to dance, what can I say. The instructor also teaches Tango and the Salsa. Another project I am working on, is creating centerpieces for a Broadway themed tea party. My girlfriend asked me for my help, so away I go. I created the invitations too. We have the option to dress up as a Broadway character, so I am going as Roxie Hart. I shall be posting this next month. It must be fun..so good for the heart and soul. I am a terrible dancer.. The cutlery is very good quality and looks like the day I bought it. Hi Linda, love your fall tablescape. The cart on the mirror wall looks fabulous and at first I thought it was a square table. Have fun in the dance class. I love to dance too. Your little dancer is cute. Enjoy the commissions you are doing too. Hi Linda, beautiful tablescape, wondering where you store all your beautiful things? Sounds like you are very creative and very busy. Have a great week-end! And congratulations on the Van Gogh-ish Tablescape. So happy and warm. And the room is priceless but then it is all your Home. Good morning dear linda! You are certainly on top of the game here with such lovely accessories. Our weather is turning cool so soon I can play with some pumpkins on the weekends. Have a great weekend!. Loving the beautiful blue plates on the deep tolden dishes. 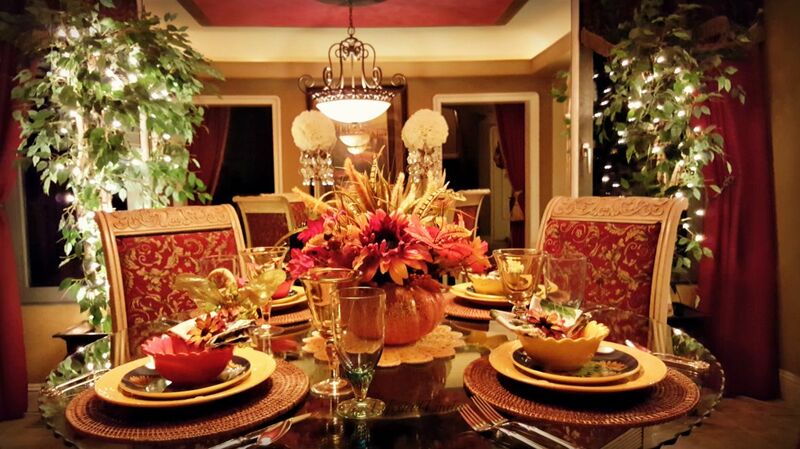 Your centerpiece turned out beautiful. I wish I had used those glasses for our little family get together. I wasn't thinking clearly but those would have made my table look so much better! The dancing class sounds like fun. I know how good you are at dancing so I know you'll have a good time with it. I like that dessert cart- great idea! Your home is lovely, Linda. 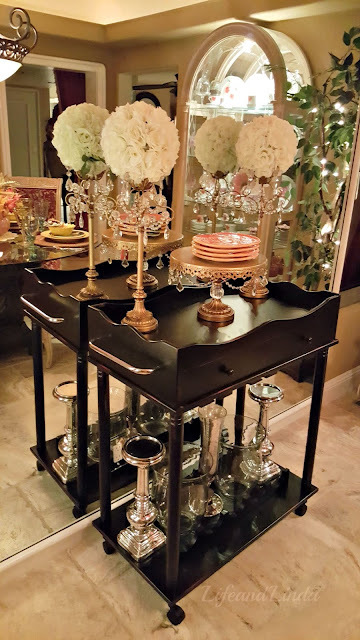 I really love the dessert cart, I'm seeing them (or bar carts as they are sometimes called) everywhere, I like the ones Pottery Barn and Pier 1 carry. Now, if I just had the space! Have a nice weekend. Cool temps and rain here in the Midwest. A dessert cart?! 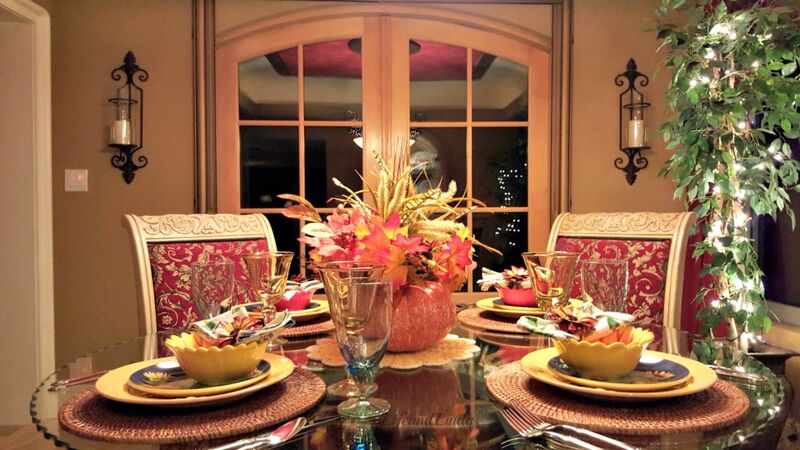 How lucky are your guests : ) Your tables always look so beautiful. I love the colors of fall - probably my favorite. And the dance class - good for you! I have shared about it before but every time I SEE Irish dancing on TV I somehow think I can get up and actually DO it. Not so much, haha. You are going to make a fabulous Roxie Hart! Can't wait to see. Your house is so gorgeous, and I love the effect of the mirrors. I envy your dancing abilities. I took C & W lessons years ago when I lived in Colorado. Basically I have two left feet, but I am now bumbling my way through Zumba at the Y every Wednesday. Your home is so beautiful, Linda! I love your tablesetting, and have always loved the Napoleon flatware. It's perfect with the bee plates! Your arrangements are so pretty and I love the dessert cart. The dancing sounds like such fun. I wish I could join you. 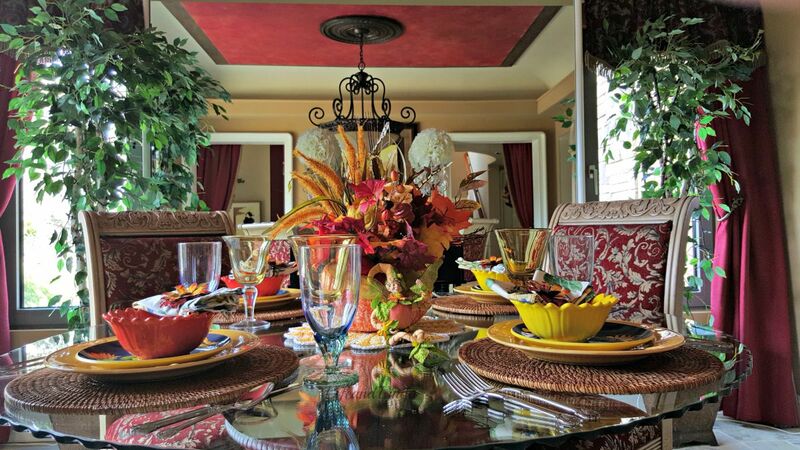 Your decorating style is fabulous and your home is perfect for entertaining! 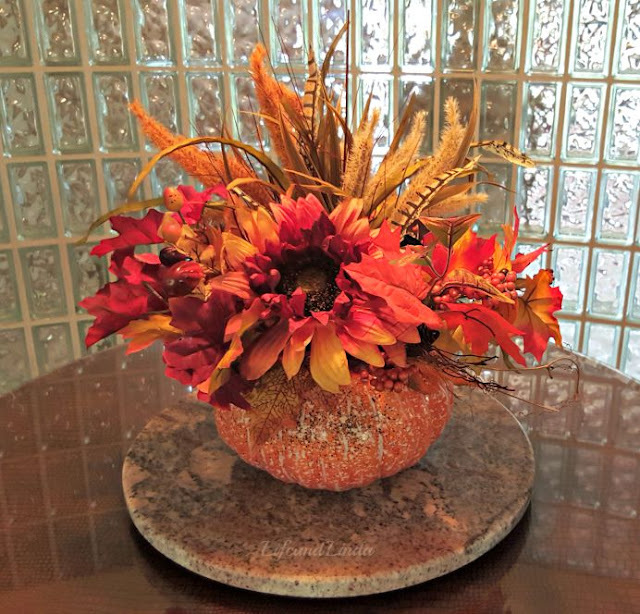 You have made Fall dance in your home with the colors, textures and designs. How fun that you are taking this dance class-I love that you are, such great exercise too. Beautiful table! I love those adorable bee plates. Wow those are so sweet! The centerpiece you did looks just great, love sunflowers. Your table is beautiful...of course, your whole house is. Love the mirrors and the twinkle lights ~ two of my favorite things. Can't wait to see what the party is like! I love that cute icon of you dancing. My friend here loves to dance as well.